Finish your project car with these Lokar Shifter Ring and Boot Sets. 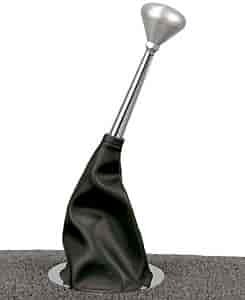 Lokar Shifter Boots are black Naugahyde and available with your choice of a stainless steel base ring or billet aluminum base ring featuring a ball-milled edge and stainless screws. All boots hug the shifter lever and there are no unsightly pull ties or laces. Shifters and shift levers shown for illustration purpose and are not included. 70-HRB is rated 4.0 out of 5 by 2. Rated 5 out of 5 by KS60 from Perfect as a replacement for the T5 transmission . I bought this just recently and am very satisfied. I used this on my 86' CJ7 replacing the rubber boot that caused the transmission to jump out of 4th gear. Rated 3 out of 5 by pjamc from Expected more from Lokar Overall it is good product, but the boot could have been better. The stitching on the two seams does not match and its visible.